The palate shows abundant granadilla, guava riper green fig with a gooseberry oiliness, accentuated by a juicy, zesty grapefruit like citrus finish. Clear and bright with a lime green tinge in colour, with complex aromas of crushed fig leaves, intense green guava skin, and granadilla. The palate shows abundant granadilla, guava and riper green fig with a gooseberry oiliness, accentuated by a juicy, zesty grapefruit-like citrus finish. The fresh acidity carries the fruit to the back of the palate and prolongs the lingering after-taste. Three different Sauvignon Blanc vineyards and a neighboring Semillon vineyard were used for the 2017 Sauvignon Blanc. The vineyards are planted on South and South Westerly facing slopes with altitudes varying from 300 - 350m above sea level. These vineyards are the most elevated position on Zevenwacht facing False Bay, deriving full benefit from the cool sea breeze during the ripening stages. Pungency and aromatic concentration are the hallmarks of a fine Sauvignon Blanc and there is no shortage of these characteristics on the lofty southern slopes of the Kuils River hills. Grapes were picked at various stages of ripening to provide us a broader spectrum of flavours to work with at blending. 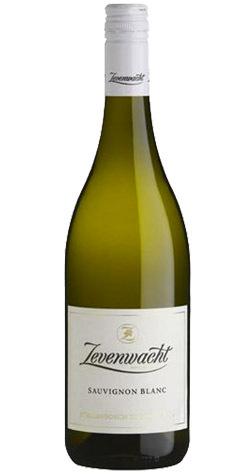 The wines of Zevenwacht are distinguished by their classic style and finely crafted elegance. Winemaker Jacques Viljoen honours century-old wine-making traditions, yet is boldly innovative, welcoming the contribution that modern technology makes to the vinification of premier wines. Covering 120 hectares of the 450-hectare property, the vineyards are ideally situated for the growing of quality grapes. Zevenwacht is characterized by good quality, varied soils and the vineyards have been selectively planted with red and white noble varietals.